So I got out of step with this and now I’m trying to catch up all at once. 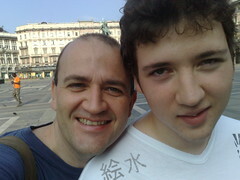 This was the day we left Milan for Nice. So, although the longest journey was behind us (Vienna to Milan) it was still difficult to get up and get on another train for hours especially since neither of us had been to Milan before and we’d arrived in the dark the night before. But we did. We walked down to the square in front of the Duomo first of all, so that we at least felt we’d gotten a feel for that old bit of the city. This was our first proper sunshine too but it was comfortable in the morning air. We got the metro to the central station and then I spent an annoying 30 minutes queuing to try to make a reservation on a train only to be told that I couldn’t get one and should just get on the train. This is an annoyingly vague aspect of the interrail system, whether you have to reserve or not and how much extra that costs. I hope to write something up about that later. Stazione Centrale has recently been refurbished and is an amazing sight – I’m guessing from the grubby bits that aren’t quite finished yet that it had become pretty poor, but maybe someone else here knows for sure. Basically the journey was pretty (and not so pretty) northern italian countryside down to Genoa and then along the Cote D’Azur in and out of tunnels, past little coves of blue water and exclusive looking houses perched on clifftops. Nobody checked our ticket all the way. Arrived in Nice OK, but walked completely the wrong way to find the hotel so spent half an hour sweating back again with suitcases. Our hotel was not the cleanest or best equipped (a comparison of each hotel is also on my to do list) and of course the a/c wasn’t working properly but there was a supermarket next door where we could get a quick food fix before taking a walk down to the beach (about 10 minutes) to see what there was to see. Then we both agreed it was time to just crumble into bed (once I’d just gotten the wifi working). I didn’t get much sleep though because we had to have the window open occasionally to deal with the heat but Nice is not a quiet place on a Saturday night.